One of the best parts about going to the hairdresser is having someone else tend to your hair. That includes the relaxing process of having your hair washed, but Panasonic is now about to unveil a robot that does the job for people. If having a robot hold your head in their metal hands creeps you out then you might want to be careful of outlining your wants when your kids pick a funeral home for you. This Panasonic gadget is meant for nursing homes to take some pressure off of orderlies dealing with the elderly. Although some elderly are quite calm, others become very violent with age. 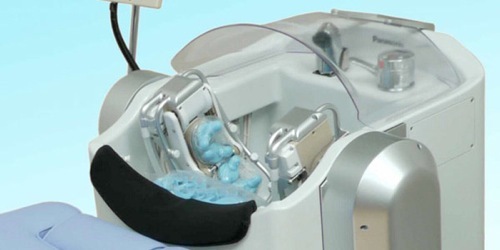 The sixteen robotic fingers wash hair after scanning the exact shape of the head. The three motors use just the right amount of pressure for shampooing, rinsing and even giving a bit of a scalp massage. It will even remember the person’s shape of the head for later usage. Although it’s incredibly creepy thinking about a robot giving your head a rub down, I suppose it’s no more strange than the massage machines you find at the mall.